We’ve lived in a small kitchen for 15 years and I love it. I actually enjoy having everything within arms reach (literally). I am over having to store pots and pans inside our oven and using the top of our refrigerator as storage, but otherwise what’s not to love about small kitchens. To make the most of the small kitchens we’ve had in New York and now LA, we’ve had to come up with a few tricks. These tricks have evolved now that we have a toddler in the house but having a small kitchen also works well for him. Here’s how we make the most of our tiny kitchen. You won’t find these tips in Martha Stewart but they work for us. 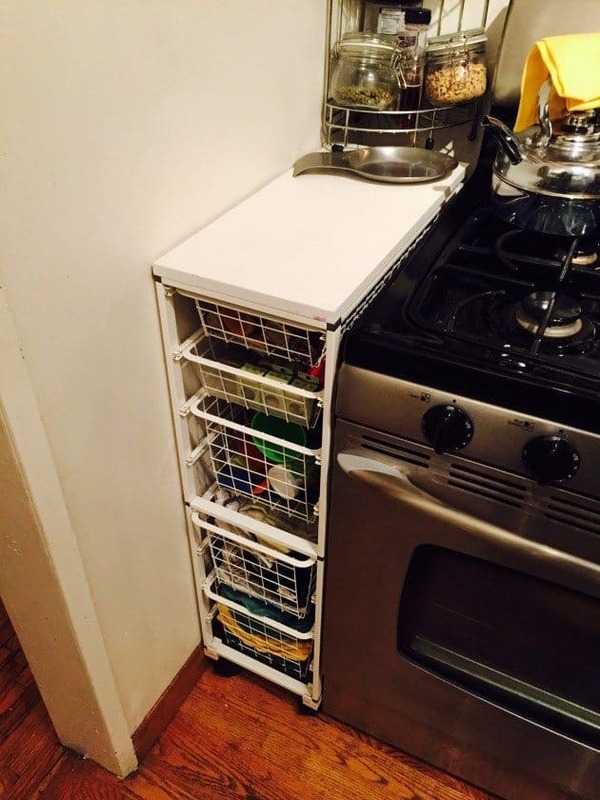 When not in use, your oven is basically a big empty cabinet (with racks). 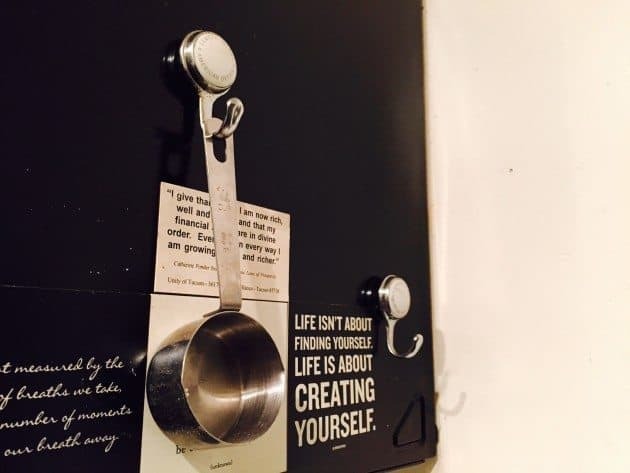 You can use it to store cast iron pots and pans, but nothing else. I’ve made the mistake of turning on the oven with an apron and rubber mits in there. Not a good discovery. Beware of plastic pot and pan handles. 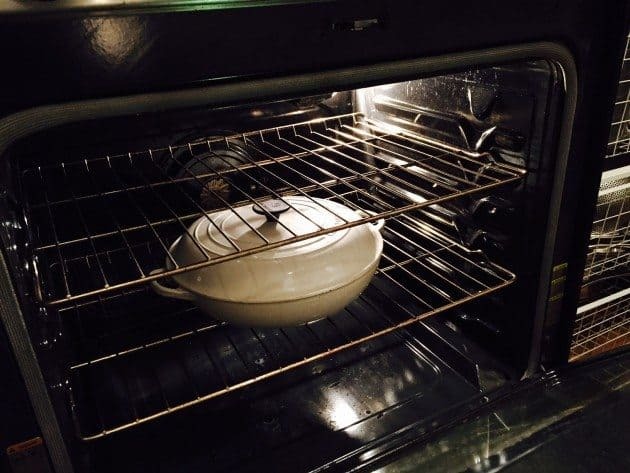 We only store our Le Creuset and cast-iron pan. Use this tip at your own risk. I’m sure we could find better alternatives but we’re used to the convenience now. We made a custom Elfa drawer system to fit some very narrow spaces. They are very utilitarian looking but they are extremely effective. There are no moving parts as the drawers and trays slide along tracks. 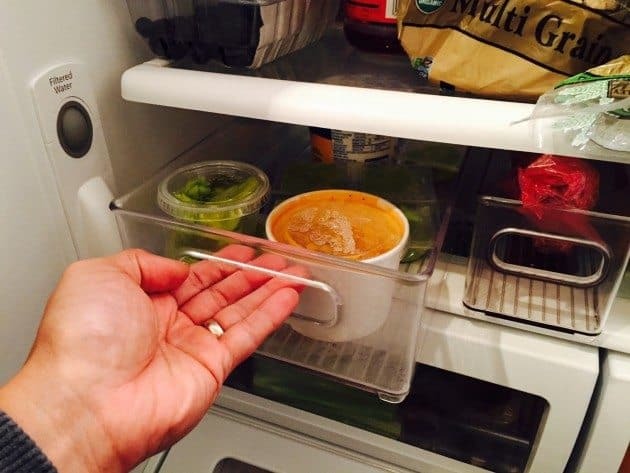 Additional refrigerator shelves and trays help to organize and make use of the entire height and depth of the fridge. The trays slide out so we can easily access what’s in the back and the shelves help us to stack items and make use of taller areas. Keeping stuff off the countertop is the key to having enough kitchen counter workspace. There’s no room for a knife butcher block and measuring cups and spoons take up too much room in the cupboards. 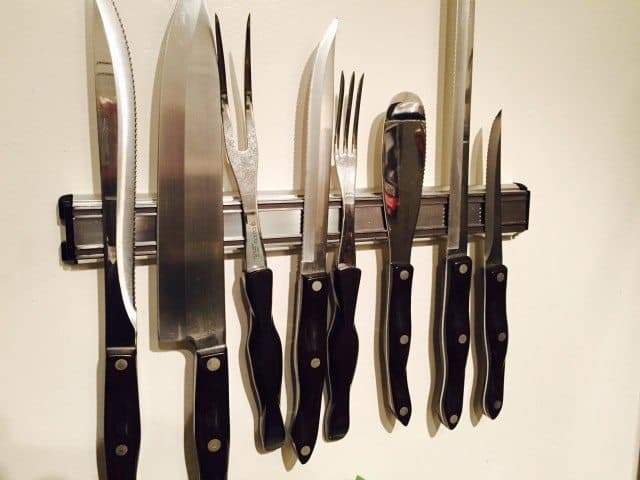 Use magnet strips to hang knives and hooks to hold measuring spoons. If you’ve got the ceiling height, use it to hang your pots and pans. Shadows are always a problem in a small kitchen as the lighting is always small. It’s tough to see when you are cooking when you are obstructing the only light in the kitchen. Install under cabinet lighting and consider other lighting solutions for your kitchen beyond the overhead lights. Store china, champagne glasses, special mugs and other non-essential kitchen gear, outside of your kitchen. You don’t need it to take up valuable space on your kitchen shelves for items you use everyday. If you only use that toaster oven once a month, get rid of it. Use that valuable space on the countertop for something else. Opt for a magic bullet instead of a blender. Ditch the coffee maker and go with an Aeropress. There are a lot of replacements for appliances that we don’t need and that frankly work better. These tips can apply to kitchens of all sizes as you try to make the most use of your space.